This Printable Valentine using small stretchy hair ties is one of my favorites. Although it doesn’t work for an entire school class, it is colorful and fun with something that little girls will actually use. We are making these ones for my daughter’s dance class. This Printable Valentine comes six to one page. The best part is that it can be printed completely in black and white, since the hair ties is what gives this Valentine its pop of color. To give it the stability it needs when the hair ties are on the Valentine, it will need to be printed on cardstock. Cut out the Valentines and have your child fill them out before adding the hair ties. Cut out squares on either side of the empty space below “Us Together.” Make sure you cut in far enough on either side that the hair ties don’t have to be stretched out to sit on the card. Add the hair ties, by stretching them over the paper to the cut out area of the Valentine. You can find the printable for this Valentine below. 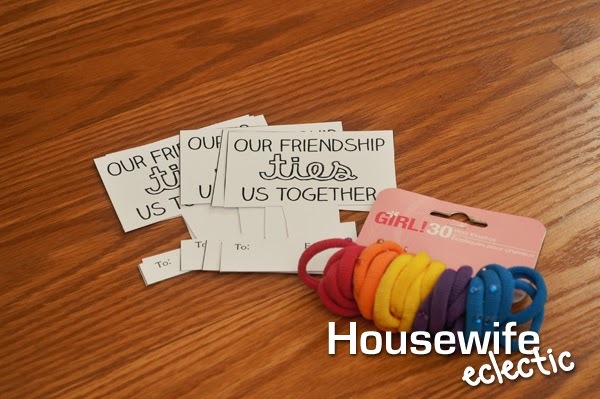 All Housewife Eclectic Printables are for personal, non-commercial use. This is such a great idea! I love how you used something other than candy! So cute, pinning! Love this idea! And for a dance class, that is genius! They all need hair ties to pull their hair up! 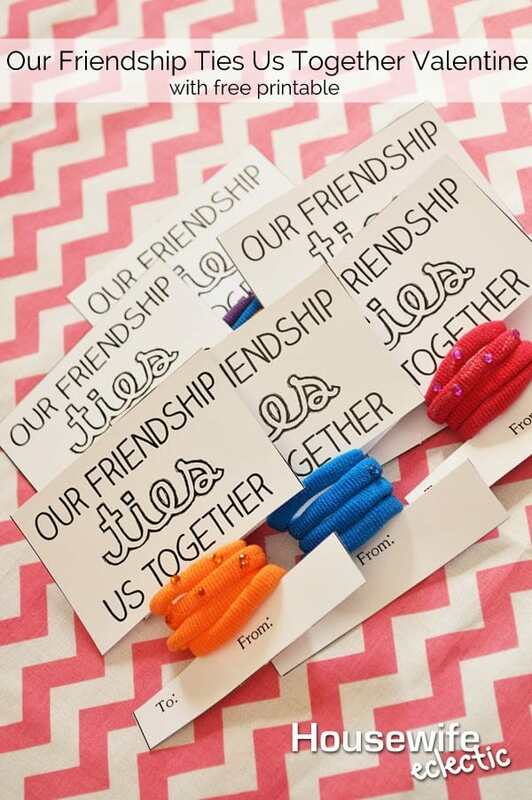 My daughter would love to hand these out to her friends – such a cute idea!! Love this! My little girl would think this was great! What a fun and different idea. I love this instead of candy. These turned out SO cute! Love the fun colors of the hair ties. These are so cute for girl Valentines. They always need hair ties. You're on a roll with the cute Valentines. What a fun idea for little girls! Pinning! You can never have too many hair ties. I love useful valentines!